If you’re phone is unlocked, people may be able to mess with your Facebook profile or snoop your emails. But with this feature, you can be assured they won’t access your Gliph account in any way via the iPhone app. We’re curious to hear how this improves your life. Feel free to share a story about how this feature helped you by emailing us at support@gli.ph. Access this feature in the new iPhone app under Settings -> Security Settings. This is a big new feature that is virtually unprecedented. We’re allowing you to secure your private contact information and communications like never before. 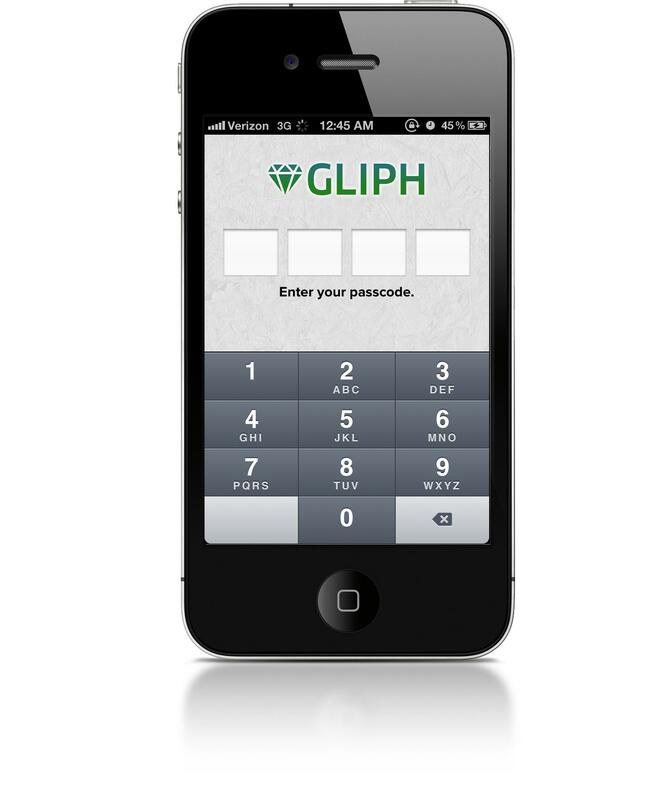 Lockdown Privacy Protection allows you to turn off password reset on your Gliph account. Normally, if you forget your password, we offer a password reset procedure. The problem is, how do we decrypt your old messages and facets if we don’t have your old, lost password? But why force you to trust us? If you turn on Lockdown, thereby turning off password reset, we remove the master key from your data encryption. What does that mean? No one can decrypt your data without your password. No one. You should be aware of the implications of this feature. First, if you turn this on and you lose your password you are screwed. No one can reset your password or otherwise recover your data. It is unrecoverable. Second, if you are having extremely private communications with another user, you should alert them to also turn on Lockdown privacy protection, so both ends of your messaging are secure. Third, be sure you use a strong and unique password (that you remember) in combination with this feature. We are ossessive and very critical of the user experience we provide in Gliph. This includes how long it takes to load stuff, the way the colors look and how Gliph connections are represented on screen. We know what a great app can look and behave like and so we are on a constant quest to improve the look and feel of Gliph. Version 1.2 of the iPhone app represents a step forward in user experience. We’ve now revised the look of the Activity View with some way-cooler styling and a change to meta. The new Activity View now provides a lot more information about who you are communicating with. That is, if you have information about them. We took the emphasis in this view off of the Gliph itself. Instead, we let the tags you choose show through in bold and if a Gliph connection shares their name, we show that. We also now show message read status in the Activity View. This means that you get a nice blue fade to show which conversations have unread messages in them. We will continue to refine the Gliph user experience, and we’re counting on you to help us by providing feedback about what you think. 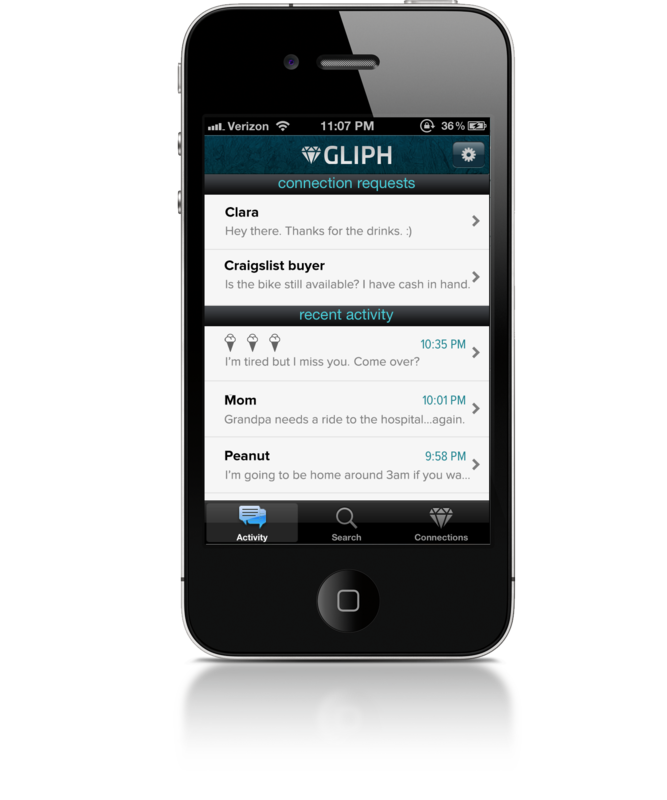 Your feedback helps us prioritize aspects of the Gliph experience. Also, we love email from Gliph users! Here’s our email address: support@gli.ph. We are super-pumped to be releasing these privacy features and UI enhancements to the market today. They represent a lot of hard work from our team, both on the front-end and in the back-end engineering, design and beyond.